Call us today at 727-346-6423 to discuss whether a single or tandem axle trailer is best for your next trailer. 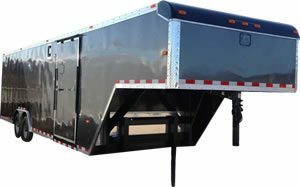 Visit our Enclosed Trailer Shop. There are many factors to evaluate when deciding whether a single axle trailer or a tandem axle trailer is best for you. First, no matter what trailer you tow, you should not tow at excessively high speeds. The stopping distance required increases dramatically as your speed increases. The extra weight of the trailer will make stopping quickly much more difficult. Better to arrive a few minutes later but safely than not at all. Single axle trailers weigh and cost less and are more maneuverable than the same sized tandem axle trailer. Single axle trailers have fewer tires/brakes to maintain and replace. One reason to own a single axle trailer is if the only place to park the trailer is in a very tight spot. Two axles might make maneuvering it into a tight spot difficult. The towing angle for a single axle is not important, so it doesn’t matter if the trailer is level as the trailer is able to rotate on its axle. Since a single axle trailer weighs less it’s good for towing and fuel economy. Some of the disadvantages of single axle trailers are that they can haul a smaller payload than the same sized tandem axle trailer. In many states single axle trailers are not required to have brakes whereas the D.O.T. requires that all tandem axle trailers have brakes. A single axle trailer will be harder on tires as more weight will be carried per tire than if it were a tandem axle trailer. Tandem axle trailers are more stable at highway speeds. Tandem axle trailers are safer. Not only are tandem trailers required to have brakes whereas in most states single axle trailers are not required to have brakes, you have brakes on four wheels instead of two. When properly loaded, a tandem axle trailer is less prone to sway though anti-sway bars can minimize this. Tandem axles may track a bit straighter in a side wind and will likely bounces less than a single axle trailer. A tandem axle trailer will have close to triple the payload compared to the single axle version of the same sized trailer. If you should ever need to increase the weight you haul in the future, with a tandem axle trailer you’ll likely not have to upgrade later. If you decide to sell your trailer in the future, a tandem axle trailer be worth more than a single axle trailer. A tandem axle trailer costs more and weighs more. Because a tandem axle trailer is heavier than a single axle trailer, your mileage will suffer. The tolls are often triple not double what a single axle would pay and in some states each additional axle is another toll. A tandem axle trailer will tend to have more maintenance issues than a single axle trailer. For example, four tires to buy, four wheels to maintain with bearings, grease, etc. With a tandem axle trailer, it is much more important to tow level than it is for a single axle trailer. Often you see a tandem axle trailer being towed tongue up or tongue down. If the tongue is down the front tires get extra weight as trailer “bears down” on them. If the tongue is up the back tires will get extra wear due to the added weight. In the end the decision as to whether you should get a single or tandem axle trailers depends on your personal needs. If you are going to haul light loads infrequently then a single axle trailer will likely meet your needs. If you are hauling heavy loads, frequently or over long distances or are concerned about safety then a tandem axle trailer may be a better fit for you. Always be sure that whatever trailer you select has sufficient payload capacity to haul your loads. If you regularly tow very heavy loads you might even consider a triple axle trailer. If you are hauling heavy loads in a double axle trailer, then blowout of a tire might immediately cause the axle without any blown tires to be over its load limit as it is now carrying all of your load. With a triple axle trailer, even with a blowout you are less likely to ever be over your axle load capacity because if you do have a blowout there will still be two axles to carry your load. If you have any questions about selecting an axle configuration for your needs, feel free to call us at 727-346-6423, email us at email us at or click on the Chat now button on the right.